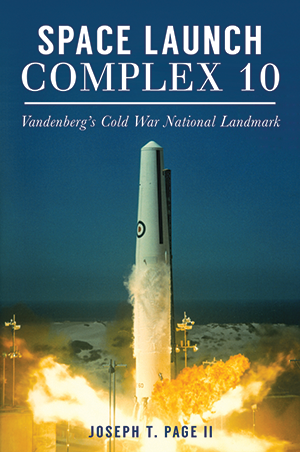 Situated in the sand dunes of California's Central Coast, Space Launch Complex Ten, often called SLC-10 or "Slick Ten," is a National Historic Landmark that commemorates a powerful Cold War legacy. Home to Vandenberg's Space and Missile Technology Center, or SAMTEC, the facility contains the rich technological heritage of the U.S. Air Force's space and missile launch systems. As the only remaining Thor intermediate-range ballistic missile launch site in the world, SLC-10's noteworthy achievements span the globe. The complex trained British Royal Air Force missileers for Project EMILY, assisted during nuclear atmospheric tests in the Pacific and launched military weather satellites in support of the covert National Reconnaissance Program. Former air force space and missile officer Joseph T. Page II introduces these amazing stories of dedicated men and women who led the American military effort to explore space. Joseph T. “Joe” Page II is an amateur space historian and former air force space and missile officer who grew up at White Sands Missile Range, New Mexico, the “Birthplace of America's Missile and Space Activity.” After spending tours of duty in California, North Dakota and Afghanistan, Joe and his family settled in New Mexico. He is the author of three titles in Arcadia Publishing's “Images of America” series, focusing on military aviation and space history. He holds a bachelor's of science degree in engineering technology from New Mexico State University and a master's of science in space studies from American Military University. He is currently working on a bachelor's of arts in history.